Today, when you order "At The Table August 2018 Subscription video DOWNLOAD", you'll instantly be emailed a Penguin Magic gift certificate. You can spend it on anything you like at Penguin, just like cash. Just complete your order as normal, and within seconds you'll get an email with your gift certificate. 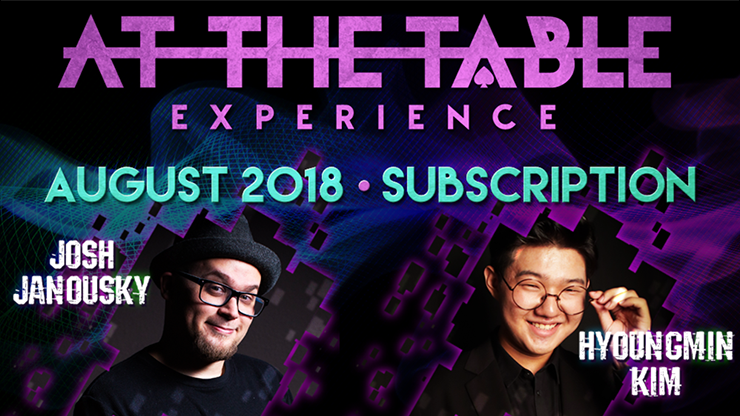 Pull up a seat and be amazed as we welcome 2 of the finest magicians to At The Table! First up this month, a rising star in magic, Josh Janousky has earned a reputation for sharing material that is both extremely clever and highly workable. Josh's magic can be found in the working repertoires of many industry legends and has been tested in real world situations thousands of times! At just 27 years old, he has taken the world of magic by storm and shows no signs of slowing down! Despite his very young age, Hyoungmin Kim has proven himself at various magic conventions worldwide. His light-hearted performance style is always entertaining and incredibly refreshing to watch! In this lecture, you will experience effects that he has perfected from his years of competing and performing, along with new techniques he has developed to share for the first time! Join us as we welcome Josh Janousky and Hyoungmin Kim for their amazing lectures, At The Table!